Throughout the month of December, I am honored and grateful to share posts by ADHD experts. In this series of Meet the ADHD Experts, our experts are sharing their thoughts about ADHD. Let me introduce guest blogger Ari Tuckman. Ari Tuckman, PsyD, MBA is the author of three books: “Understand Your Brain, Get More Done: The ADHD Executive Functions Workbook”, “More Attention, Less Deficit: Success Strategies for Adults with ADHD” and “Integrative Treatment for Adult ADHD: A Practical, Easy-to-Use Guide for Clinicians”. His “More Attention, Less Deficit” podcast has over one hundred episodes and is approaching one and a half million downloads. 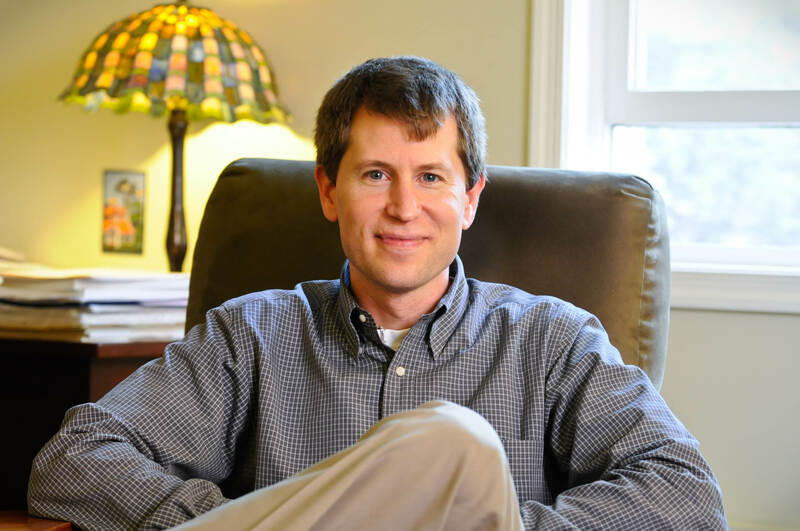 He is a psychologist in private practice in West Chester, Pennsylvania. I fell into working with adults with ADHD when a psychiatrist asked me whether I wanted to help his patients with practical matters of daily life. He found the medication to be helpful with the basic symptoms, but these patients needed help with the skills of time management, organization, prioritization, procrastination, etc. At the time (1998), few clinicians specialized in ADHD in adults, so there was a great unmet need. My joke is that if you knew three things about adult ADHD, then you were the expert in town. Now you have to know four. So it is slowly getting better. ADHD can be very impairing before it is diagnosed and treated. But the good news is that there is a lot you can do to make someone’s life better once they know that it is ADHD that underlies a lot of their difficulties. ADHD tends to respond well to treatment and we know a lot about which strategies tend to be most effective for people with ADHD. So it can be a very optimistic diagnosis if you use that knowledge effectively and work hard at it. Learn as much as you can about it, whether it’s you who has ADHD or your romantic partner, family member, etc. The more you know, the better off you will be. There is no need to re-invent the wheel when there is already so much that is already known. You obviously need to customize any strategies for your own situation, but there are a lot of good ideas already out there. I sometimes hear that the romantic partner or family members of the person with ADHD are hesitant to invest the time to educate themselves about ADHD, saying that they already do enough so they shouldn’t have to put in the extra work. While I appreciate that they already feel overloaded, there is great power in understanding ADHD and how your partner operates. While it may not be their responsibility to ensure that the person with ADHD does what they need to, it is their responsibility to ensure their own happiness. If learning about ADHD helps you get your own needs met more effectively, then why wouldn’t you do it? Ultimately, we are all responsible for our own happiness. We wake up at 6:15, my son gets on the bus at 7:20 and my wife and I head out by 7:45. It sounds like a lot of time when I say it, but it goes pretty quickly, especially if we get behind schedule. At this point in the school year, I have a good sense of what needs to be accomplished by when in order for us to get out on time. I make breakfast and know that we have to start eating by 7:00, so that helps keep us on schedule. It’s easier to break the morning in half—before and after 7:00. There is a lot of good information out there about ADHD. I’m a big fan of getting good ideas wherever I can. So keep educating yourself. The best part is that the strategies that work best for people with ADHD tend to just be plain old good strategies that work well for most people. Hugs and happy organizing is all about client success stories. 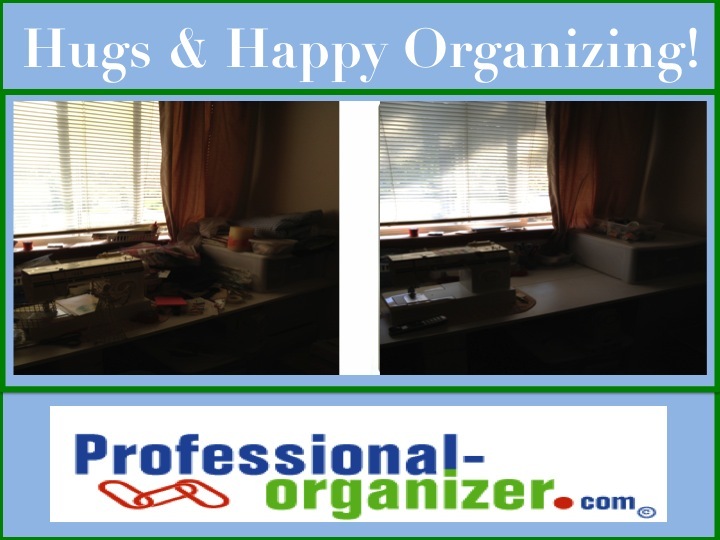 Here you will find a craft and sewing room organizing success story. Sewing and crafting are wonderful ways to express creativity! What happens when we are overloaded with materials, too many projects, and a limited space? Craft room chaos! You can enjoy your quilting, crochet, sewing, and knitting more with craft room organizing. Follow these simple steps for your craft and sewing room success. Start with decluttering. Decide which materials inspire you and which can go on to another home. In Houston, Texas Art Asylum is a wonderful resource for sharing your stash. Group you materials by project type. Group your projects that are started, and consider how you will keep materials together for each project. I suggest ziploc bags or clear plastic containers (Amazon affiliate link). Group your tools together, such as scissors, needles, and rulers. Place these in an easy access spot on your work space. What made a difference in your craft and sewing area? More Hugs and Happy Organizing success stories on pinterest. Thanksgiving is our national holiday for gratitude. We are abundantly blessed in our country with privileges and resources. The celebration focuses on an abundant table, set with all sorts of fabulous food. It can be a overwhelming to prepare for this holiday. 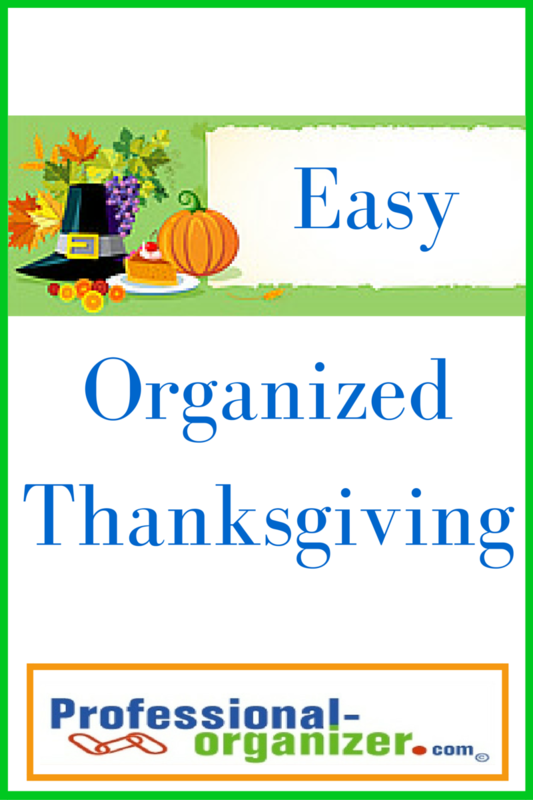 Let’s plan an easy organized Thanksgiving this year. Thanksgiving is when our family and friends come together to celebrate. Start with a guest list and a meal plan. Knowing how many guests are coming makes setting up easier. Knowing your meal plan makes for easy delegation and participation for guests. Everyone wants to help, so when asked you are ready to share responsibility for side dishes. Write down a time line for food preparation. Frozen turkeys often take longer than expected to defrost so start early. Starting with the Sunday before the holiday, write down what you want to accomplish each day. Be sure to include dates for grocery shopping, pie baking and making side dishes. Not enough oven room? Think about crockpot dishes for sweet potatoes or green bean casserole. You can even do your turkey in the crockpot! Ask your family to help. They can set your tables early and make table decorations too. Set out your table ware and serving pieces and label these with post it notes. For guests bringing dishes, be sure to have serving pieces and spots available. Purchase inexpensive dollar store cartons for leftovers for yourself, your family and your guests. Sending leftovers with guests is a special gift for them! Join me for more Thanksgiving tips on food and crafts on pinterest Happy Holidays. Hugs and happy organizing is all about client success stories. 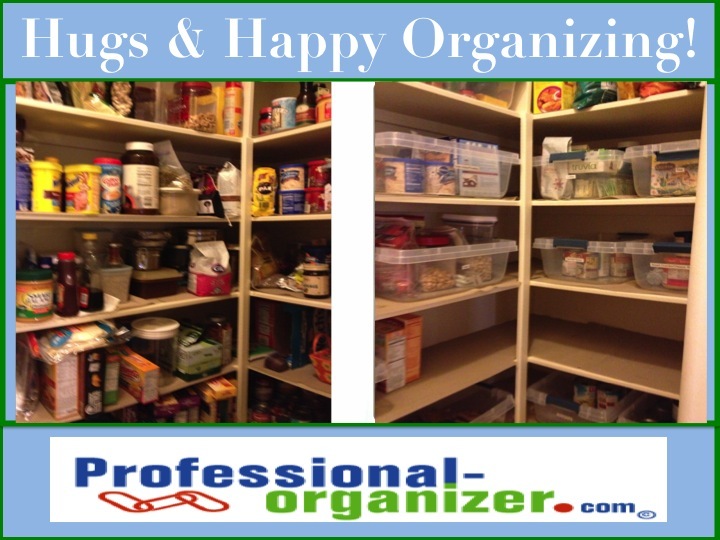 Here you will find a pantry organizing success story. Families, family dinners, family holidays all focus on the pantry! Is you pantry chaotic? Is it a jungle of different cans, granola bars and seldom used mixes? Difficult to know what to make for dinner? It’s time to organize your pantry to make your life and your family meal times easier. Remove all the items from the pantry, tossing what is expired. Everyone has their own opinion of “expired”. Decide on yours and follow through on it. Group the items together by use and like the grocery store. Typical categories include baking, breakfast, canned veggies, canned meats, beverages, pastas, rice, snacks and condiments. Use plastic bins to help group items together and take advantage of deep shelves. Bins help you “reach” to the back of a deep area. Place a front and a back bin so you can move the front bin and reach the back bin. Remove snack items from boxes for easier access for your kids. Place these bins on a low shelf for easy access for the kids too. Label the bins so everyone knows where items belong. Place items into your pantry by use. The more frequently used items should be stored near the entry. Extra storage of bulk purchases should be in the back and at a lower level. Keep the floor clear. Just like a closet, blocked access creates disorganization. Keep a grocery list dry erase board easy to access in the pantry. Family can add to the list and it’s easier to grocery shop too. Want to rethink the gift giving? Clutter free gifts make the difference! Join me on pinterest for Happy Holidays. I love the idea of bringing a little something to share with a hostess at holiday time. I also love sending small treats to friends and family during the holiday season. These holiday chocolates and pretzels are a wonderful small something to share. Depending on the holiday, I vary the M&M colors. I use red for valentine’s, orange for Halloween and red and green for Christmas. I make ahead holiday treats to save time and energy plus add the joy of the season to my home with sharing easy, simple and fun small bites. Enjoy these treats and a sweet holiday season! Just a smidge of chocolate and a salty pretzel base. Easy to make and share for any holiday! Wishing you a joyful holiday season! The holiday season can become a blur. There’s extra to do, to make and to finish. Company’s coming and your home is not ready. There’s gift buying and wrapping. There’s family photos and cards to write. At the same time we are grateful for our family’s being together and the abundance we are blessed with. Mindfulness is a state of active, open attention on the present. Being in the moment you can enjoy your accomplishments and share time with your friends and family. 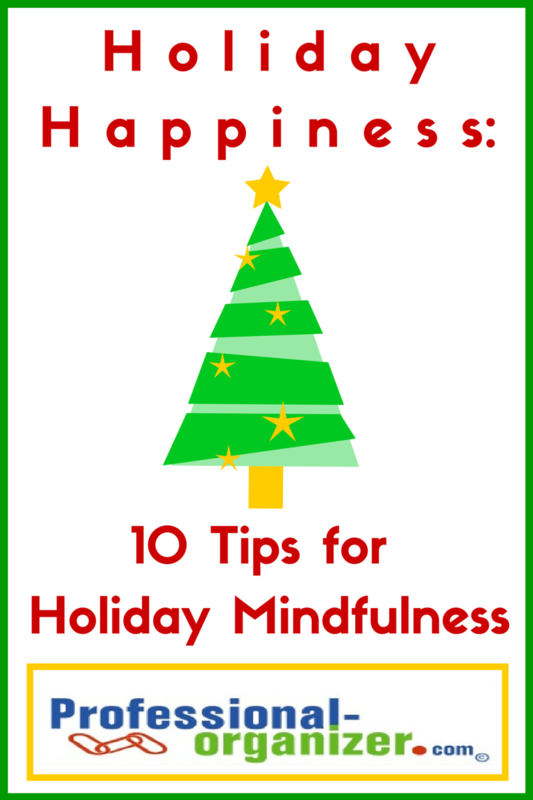 These 10 mindfulness tips will help you stay in the moment during the holiday season. 1. Make a list and move forward. When we have too much on our mind, it’s hard to be in the moment. Getting it all down on paper helps free you up. Have a weekly planning time to get it all done. 2. Delight in nature. It’s a time of seasonal change and beauty. Take a few moments every day to notice the color of the leaves, the duration of the day and nature around you. You are in touch with the changes around you. 3. Focus on fun. Got leaves? Rake them together and jump in. Hate laundry? Host a laundry party with music and snacks to get it done and off to closets. 4. Nurture yourself with rest. When we think we have too much to do, our rest is the first activity we diminish to add more time to the day. 5. Embrace inclusion. Include other’s in your celebrations that are unable to join their family for the holidays. Adding more people multiples the joy of the season. 6. Troubled by a rude relative or stranger? Think about being overly kind throughout the holiday season despite a difficult situation. Instead of ruminating about it, return joyfulness. 7. Share gratitude. Hug your family, friends and strangers to share the joy of the season. Write a note to express your gratitude. Call or text to say thanks. 8. Give yourself extra time to savor a moment. A little extra time between events and errands makes for less stress. 9. Work together with others. Delegate and partner with people and resources around you. Incorporate your family into holiday organizing and activities. 10. Keep spirituality in your season. Materialism is everywhere and it’s hard to keep yourself grounded. Whatever your belief, choose one activity that taps into your spirituality. Join me on pinterest for Happy Holidays. The holiday buzz starts early! In October and November is the time to get started on our holiday preparations. Not only do we need the time, it is tons of fun to stretch out the holiday spirit. Why not add some new tools to your holiday preparations? Get ahead this year with your holiday planning using holiday technology. Thanks to Twitter, Facebook and Pinterest, I am surrounded (virtually) by amazing women entrepreneurs and bloggers. I asked them to share what works best! I use evite to organize all the gatherings for the end of the year holidays. From guests, who will come or not, what to bring, attire and super cute templates, I just love this online tool year-round. I also love Shutterfly’s shared websites to organize the kids’ classroom parties. Once you create the event you can add a sign-up list of what to bring, and afterwards we all share our favorite pictures. Having fun just got a lot easier with these tools! Think about unplugging for a couple days during the holidays. Use your technology to plan better, such as google calendar. Automate as much as you can with holiday cards and automatic payments. Managing the way I read the news and any other topics I’m interested has changed dramatically thanks to my favorite tool – Flipboard. It makes every story into a beautiful magazine-like page that can be ‘flipped’ through. Personally, I love flipping through: news, art, culture, travel, style and lifestyle topics to name a few. I use a binder designated Holidays and fill it with lists for cards, crafts, gifts, meals and recipes. These are all printed from ListPlanIt, of course! My favorite Holiday Tech Tool is SendOutCards. http://www.sendoutcards.com/11788. I used to spend hours writing personal messages, stuffing, addressing and stamping envelopes for my Christmas cards. Every year, to try to save time, the list would get shorter and shorter. Then I found SendOutCards. I now send over 300 greetings, each with a personal message, in a fraction of the time. It allows me to send my love and well wishes in a big way. During the holidays, I do much of my shopping online to avoid mall rage. (Closely related to road rage, but without vehicles.) I never shop for anything without first checking www.retailmenot.com to see if there are coupon codes for that site. I’ve saved on everything from ordering pizza to photos. Then I log into www.ebates.com where I get paid cash back to shop! The amount varies per store, per day but when I combine those two, I’ve saved sometimes up to 25% in discounts and getting cash back. 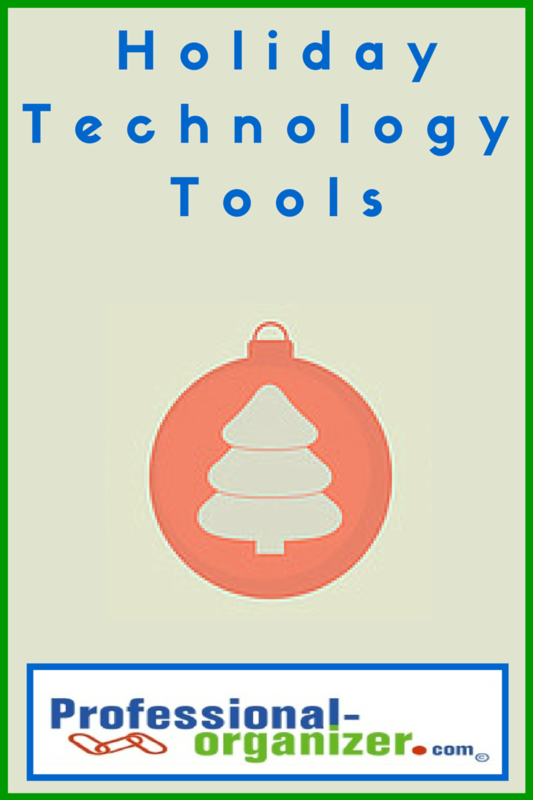 Don’t shop online without these tools! Managing holiday music has never been easier with Pandora radio. It is an option for the smart phone or computer. At www.pandora.com, you choose free music to play, choosing by artist or genre. It creates “stations” with various artists. The most amazing aspect is the “mix” Pandora radio creates with your station. The variety of artists is unlimited too! Join me for more holiday tips on pinterest Happy Holidays.